The Sound-Craft Spectrum Series Carpeted Table Lectern is a portable, stylish and affordable lectern that is perfect for any conference room or lecture hall. 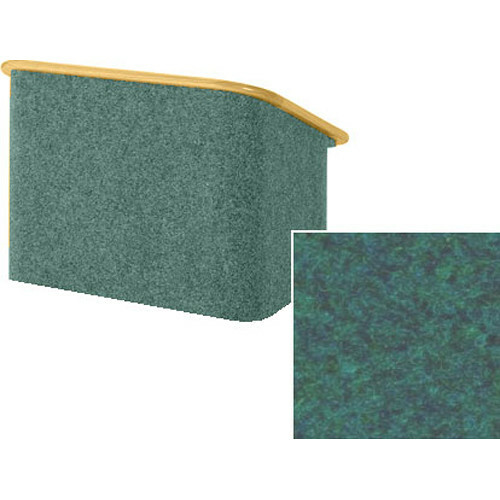 This affordable, yet functional and durable lectern is constructed of structural fiberboard and covered in polypropylene carpet-like material. With this sturdy hunter/natural oak finish, the Spectrum Series Table Lectern is abrasion, stain and fade resistant. In addition, this lectern is touch-fastener compatible, readily accepting signs or logos equipped with hook tape. Other features include a 30-watt reading light and a spacious storage area for materials and supplies. The solid oak construction in combination with the stain, fade and abrasion resistant carpet covering ensure durability and long life for this table lectern. The spacious storage area provides room for additional presentation materials. This lectern includes a large reading space that easily fits a three-ring binder or a laptop. The 30-watt reading lamp brightens up your material to ensure a seamless and easy presentation. Weighing only 33 pounds, this table lectern is extremely portable and versatile.